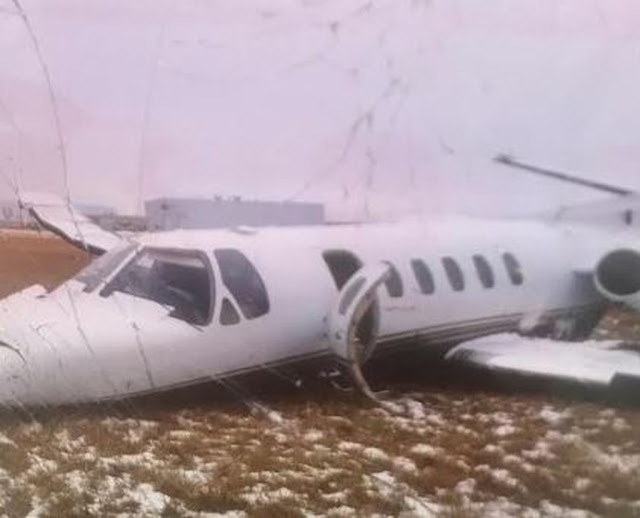 On November 30, 2018, about 1353 central standard time, a Cessna 550, N941JM, departed controlled flight while on approach at the Hector International Airport (FAR), Fargo, North Dakota, and impacted the terrain to the right of the runway. The pilot and one passenger were not injured, and 9 passengers received minor injuries. The airplane sustained substantial damage. The airplane was registered to the Slice of the 406 LLC and operated by Dirt Dynamics, Inc. under the provisions of the Title 14 Code of Federal Regulations Part 91 as a business flight. Instrument meteorological conditions prevailed at the time of the accident and the flight was operating on an instrument flight plan. The flight departed from the Sloulin Field International Airport (ISN), Williston, North Dakota, about 1250 with FAR as the destination. The pilot reported that the airplane encountered a cloud layer that was about 2,500 ft thick while he was on the approach to FAR. He stated that there was ice buildup on the wing surfaces, but he activated the deice boots several times during the approach to runway 18 (9,001 ft by 150 ft, concrete) and the airplane's performance was normal. The airplane became clear of the clouds about 400 ft above the ground (agl) and it was right of centerline. He flew back onto the centerline maintaining 120 kts during the descent. About 100 ft agl, the airplane started "pulling to the right." He applied left aileron and left rudder, and advanced the throttle to go-around. The airplane continued to the right and impacted the terrain seconds later. A witness, who observed the accident from his office window which faced the approach threshold for runway 18, reported that he "watched the airplane fall out of the sky." He explained that he saw the wings slowly "fluttering" back and forth and recognized that the airplane was about to stall from an altitude of 130 to 140 ft agl. He said the airplane's nose pitched up and then the right wing went down. He could see the belly of the airplane and he estimated that the angle of bank was possibly 80°. The passenger, who was sitting in the right seat of the cockpit, reported that the airplane started to take on ice on the windshield and the deicing boot on the right wing while they were on the approach in the clouds. He reported that the approach was normal until they neared the ground when the tail started "fish tailing." He saw the pilot push the throttles forward; however, the left wing climbed and the airplane "pulled hard to the right." The airplane impacted the ground on its right wing and then impacted back on its belly. The initial examination of the airplane revealed that the right wing's outboard section was pushed up and aft. The nose wheel landing gear assembly was bent to the right, and the nose wheel trunnion assembly was broken in two pieces. The nose wheel assembly was separated from the fuselage with part of the trunnion attached to the wheel assembly. The left main landing gear was found folded into the gear wheel well, and the landing gear components were pushed upwards through the upper wing surface above the gear well. The examination of the wreckage revealed that there was about ½ inch of mixed ice on the leading edge of the right wing, vertical stabilizer, horizontal stabilizer, and on the angle of attack (AOA) indicator. At 1353, the surface weather observation at FAR was wind 200° at 10 kts; 5 miles visibility; mist; overcast ceiling at 400 ft; temperature -1° C; dew point -1° C; and an altimeter setting of 29.91 inches of mercury. FARGO — No one was hurt when a plane veered off a runway at Hector International Airport and crashed at the north end of the airfield just before 2 p.m. Friday, November 30th, an airport official said. 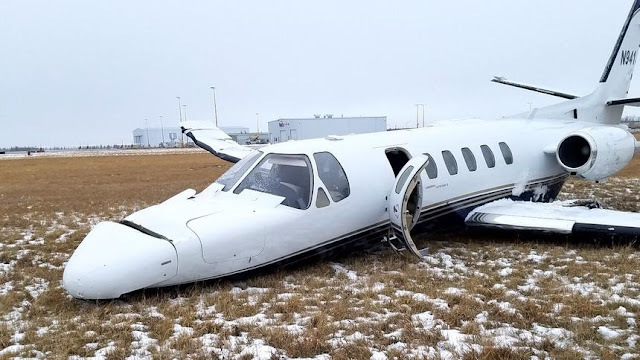 Shawn Dobberstein, executive director of Fargo's Municipal Airport Authority, said it appeared the Cessna 550 Citation II had been in the process of landing on the airport's primary runway when the small jet veered off the runway before coming to a stop. Dobberstein said he did not know how many people were aboard the plane, but he said everyone was safe after the incident and those who had been on the plane waited at the nearby Jet Center, 3802 20th St. N., for transportation. He said the plane, which had flown from Williston, suffered significant damage and will remain at the crash site until federal investigators arrive. At least two fire trucks, a handful of police vehicles and an ambulance responded to the crash site, according to a WDAY-TV reporter at the scene. Federal Aviation Administration records indicate that based on the plane's "N" number it is registered to Slice of the 406 LLC, of Helena, Montana. The Montana Secretary of State's website lists the registered agent of Slice of the 406 as Deer Creek Corporate Services Inc., of Helena, which describes itself on its company website as a registered agent and legal services company. A woman who answered the phone at Deer Creek Services said she could release no information. 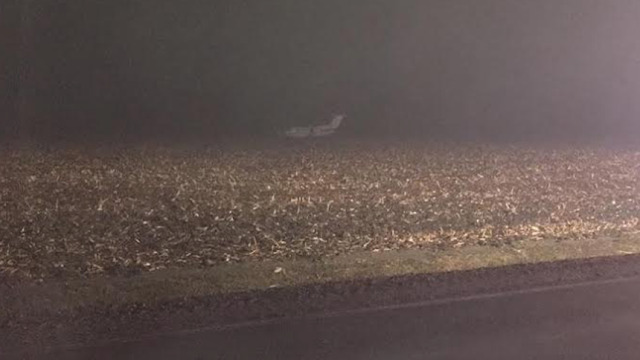 A plane that made a crash landing in a field near Moorhead Municipal Airport on November 23rd, 2016, was also registered to Slice of the 406 LLC. In that incident, the plane involved was a Beech King Air 200 that suffered substantial damage when it hit the ground during a missed approach at night. According to the FAA's final report on the Moorhead incident, the airplane was operated by Flight Development LLC, an air taxi company. The report stated the probable cause of the Moorhead crash was pilot failure to attain a positive climb rate during an attempted missed approach at night, "which resulted in a controlled flight into terrain." The pilot in that crash suffered injuries to his face as did one of six passengers on the flight, the report regarding the 2016 crash said. The commercial pilot was conducting an on-demand passenger flight at night in instrument meteorological conditions that were at/near straight-in approach minimums for the runway. The pilot flew the approach as a nonprecision LNAV approach, and he reported that the approach was stabilized and that he did not notice anything unusual. A few seconds after leveling the airplane at the missed approach altitude, he saw the runway end lights, the strobe lights, and the precision approach path indicator. He then disconnected the autopilot and took his hand off the throttles to turn on the landing lights. However, before he could turn on the landing lights, the runway became obscured by clouds. The pilot immediately decided to conduct a missed approach and applied engine power, but the airplane subsequently impacted terrain short of the runway in a nose-up level attitude. The pilot reported that there were no mechanical anomalies with the airplane that would have precluded normal operation. It is likely the pilot lost sight of the runway due to the visibility being at/near the straight-in approach minimums and that the airplane got too low for a missed approach, which resulted in controlled flight into terrain. A passenger stated that he and the pilot were not wearing available shoulder harnesses. The passenger said that he was not informed that the airplane was equipped with shoulder harnesses or told how to adjust the seats. The pilot sustained injuries to his face in the accident. The pilot's failure to attain a positive climb rate during an attempted missed approach in night instrument meteorological conditions that were at/near approach minimums, which resulted in controlled flight into terrain. 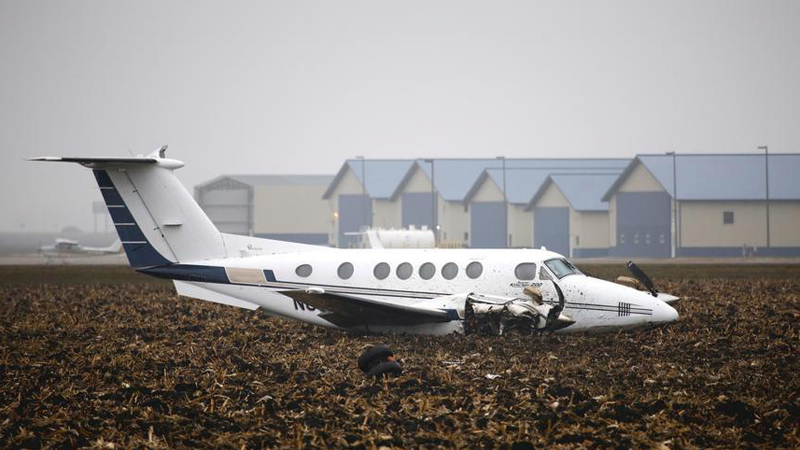 On November 23, 2016, at 1759 central standard time, a Beech 200, N80RT, impacted terrain during a missed approach from runway 30 at Moorhead Municipal Airport (JKJ), Moorhead, Minnesota. The pilot initiated a missed approach after losing visual reference of the runway environment during the final segment of a GPS instrument approach. The pilot and two passengers sustained minor injuries and four passengers were uninjured. The airplane received substantial damage. The airplane was operated by Flight Development, LLC under the provisions of 14 Code of Federal Regulations Part 135 as a single-pilot on-demand passenger flight. The flight was operating on an instrument rules flight plan. Night instrument meteorological conditions prevailed at the time of the accident. The flight departed from Baudette International Airport (BDE), Baudette, Minnesota, at 1714 and was destined to JKJ. A passenger stated that he and his work crew had been flying between Baudette and Moorhead on a weekly basis for the past 5-6 weeks to build agricultural storage facilities. The passenger stated that the pilot had flown the work crew on one of the previous flights, and the remainder of the flights were flown by the company chief pilot and the company director of operations. The passenger stated that the accident flight was the first flight in which he was seated in the copilot seat. The passenger stated that he and the pilot were not wearing a shoulder harness. The passenger stated that he was not informed that the airplane was equipped with shoulder harnesses, how to use them, and how to adjust the seats. The passenger stated that he would have adjusted the seat if he would have known that was an option and used his shoulder harness, as he is a safety conscious person. The pilot stated that before he was handed off from Minneapolis Center to Fargo Approach, he listened to the automated weather observing system (AWOS) at JKJ, which reported that light north winds, a ceiling of 300 feet above ground level, and 1.25 statute mile visibility. He checked in with Fargo Approach and informed them that he had the weather at JKJ and requested the area navigation (RNAV) approach to runway 30 starting at IVEJE, the initial approach fix (IAF). N80RT was not equipped with a wide area augmentation system (WAAS) GPS so he flew the approach as a non-precision lateral navigation (LNAV) approach (straight-in approach minima were: 300 feet above ground level and 1 statute mile visibility). He told Fargo Approach that he realized the weather was deteriorating and would make one attempt at JKJ and then divert to Hector International Airport (FAR), Fargo, North Dakota. Fargo Approach issued a clearance to the IAF, and initial approach altitude, and provided missed approach instructions. The pilot stated that he had flown this approach numerous times and briefed the approach. He stated that the approach was stabilized with the appropriate altitudes and airspeeds throughout and did not notice anything unusual. Upon leveling off at the missed approach altitude of 1,300 feet mean sea level, he looked for the runway. After what seemed like just a few seconds he saw the runway end lights, the strobe lights, and the precision approach path indicator. He disconnected the autopilot and took his hand off the throttles to turn on the landing lights for landing. Before he could even turn on the landing lights, the runway disappeared from sight due to the clouds. He immediately decided to perform a missed approach and applied engine power. He said that he referenced the flight director, but did not recall what it was indicating. He did not feel any sinking feeling indicating that he was losing altitude. He said that It seemed like just a few seconds before the airplane impacted the ground. The airplane struck the ground in somewhat of a nose-up, level bank attitude. 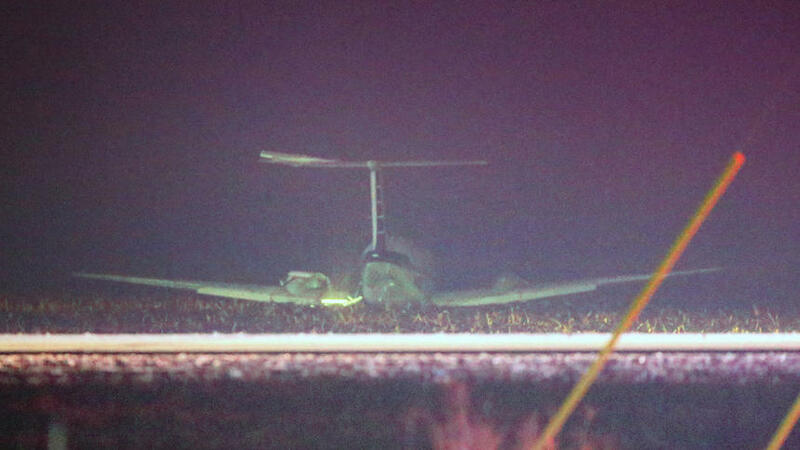 The airplane slid along the ground and turned slightly to the right before coming to rest. The passenger stated that prior to departure, the pilot said they needed to get going because the weather was getting bad in Fargo. While en route, the passenger heard Fargo Air Traffic Control Tower advise weather was not good, and the pilot stated he would try to fly to JKJ first and then fly to FAR, if that did not work. The passenger said the pilot asked him to be on the lookout for the runway and about 3,600 feet the airplane banked to line up for the approach. The passenger said he heard an audible "too low" warning three times, saw some runway lights at eye level, and then the airplane impacted the ground. The passenger said he did not think the pilot initiated a go-around, and he did not see him adjust engine power settings or move the control yoke. The passenger stated that he received facial injuries that required stitches. The pilot reported that there was no mechanical malfunction/failure with the airplane. "Stick to my normal personal weather minimums and not attempt a non-precision approach to minimums. It would of been so easy to go to Fargo and do the ILS. I have always lectured to my students on the advantage of having two pilots when things are challenging. This is a prime example of such [an accident]. Over confidence is always something that we have to try to keep in check." A review of the pilot's training records showed that the pilot completed the company's Federal Aviation Administration (FAA) approved ground and flight training program, dated August 17, 2016. The ground training was conducted by the company director of operations and the company chief pilot. The pilot's flight training, which was 10.8 hours in duration, was conducted by the company chief pilot. The pilot received and passed his most recent Part 135.293 Airman Proficiency Check, dated August 18, 2016, which was conducted by an FAA inspector from the Fargo Flight Standards District Office. The check was performed using a Beech 200 and was 1.7 hours in flight duration. The pilot received a grade of satisfactory for all of the check's maneuvers/procedures. of the seriously injured. The safety board concluded that shoulder harness use is the most effective way of reducing fatalities and serious injuries in general aviation accidents. Part 135.117, Briefing of Passengers Before Flight, states that before each takeoff each pilot in command of an aircraft carrying passengers shall ensure that all passengers have been orally briefed on: the use of seat belts, the placement of seat backs in an upright position before takeoff and landing, location and means for opening the passenger entry door and emergency exits, location of survival equipment, if the flight involves extended overwater operation, ditching procedures and the use of required flotation equipment, if the flight involves operations above 12,000 feet MSL, the normal and emergency use of oxygen, and location and operation of fire extinguishers.